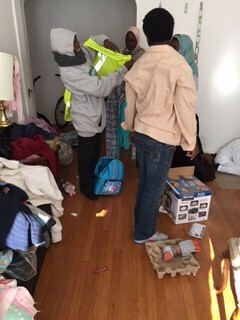 Mr. Isaac, second from left, with a refugee family in Chicago. 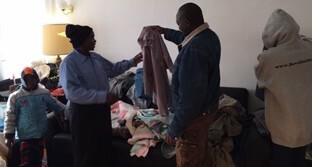 Abdulatif Isaac and Ahmed Ahmed distributed blankets, sheets, pillowcases, jackets, dresses, t-shirts, shoes, men’s dress shirts and pants to nineteen people on Dec. 19, 2015, traveling to each of the four families’ houses from 8am to 5pm that day. 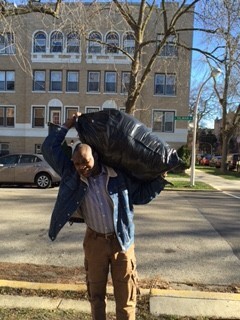 Secretary Abdulatif Isaac in Chicago on Dec., 19, 2015, carrying clothing to newly arrived Darfuri families. Since late September of this year DOHS has distributed clothing, blankets and shoes to 45 Darfuri refugees in Chicago in Louisville. We have more such donations waiting for distribution in Baltimore and Seattle, Washington. 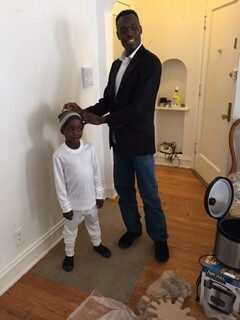 Ahmed Ahmed with one of the children who received DOHS donations. The families Ahmed and Abdulatif spoke to were worried about not getting what they need because of their currently limited understanding of English. Darfuri-run nonprofits like DOHS are vital for them because not only do they speak the same languages, but they are also proof that refugees from Sudan can organize their own businesses in the US. 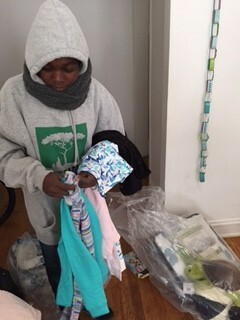 A recipient with a donated Save Darfur sweatshirt, beginning life in the US. DOHS continues to train its members how to inventory and distribute clothing and blanket donations, as well as to listen to the concerns of those we are serving (such as providing more children’s clothing. We will do our best! ).